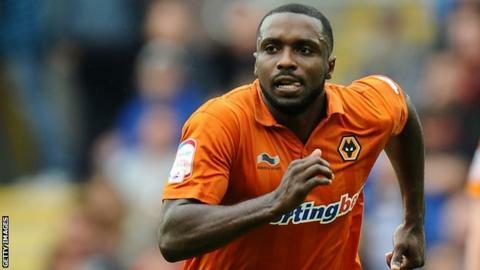 Sylvan Ebanks-Blake and Bjorn Sigurdarson scored to give Wolves their third straight Championship win and keep Peterborough pointless. Posh could have been in front early on but Lee Tomlin could only shoot wide. They were made to pay on 33 minutes though, when Wolves striker Ebanks-Blake scored from the spot after being upended in the area by Grant McCann. Sigurdarson secured the win late on when he lifted the ball over Peterborough goalkeeper Robert Olejnik. The defeat leaves Darren Ferguson's Peterborough rooted to the bottom of the table, having conceded 16 goals in their seven Championship games. Peterborough's last league win came back in March when they beat Leicester City 1-0 at London Road. It could have been different had either Tomlin converted his early chance or McCann beaten Carl Ikeme from long range. McCann then lost the ball in midfield and, in a poor attempt to win it back, brought down Ebanks-Blake who blasted the resulting spot-kick straight down the middle. Kevin Doyle twice went close to doubling Wolves' lead before the break before Ebanks-Blake was denied by Olejnik at the start of the second period. Peterborough substitute George Boyd put a long-range effort wide as the home side struggled to create chances. Their miserable afternoon was sealed eight minutes from time when Sigurdarson, released by Doyle's fine through-ball, calmly flicked the ball over Olejnik. "I was embarrassed by what I saw. We gave away two more dreadful goals and that has been the story of our season. "Everyone knows the situation we are in and it is up to us to do something about it. I've had enough time to look at things and now need to make some big decisions. "The easiest thing for me would be to walk away, but I've never walked away from anything. I've not got that in me." "We had the chances to finish the game before we did and it was good to see Bjorn come on and get that second goal. "Every day the squad is getting better. The players that were here are mixing with the new ones who have come in and everyone is learning together. "Of course we still have a lot of things to work on but for now we can have a happy bus trip home."